Roast beef is a dish of beef which is roasted in an oven. Essentially prepared as a main meal, the leftovers can be and are often served within sandwiches and sometimes is used to make hash. Left: Sunday roast consisting of roast beef, roast potatoes, vegetables and Yorkshire pudding. In England, Canada, Ireland, and Australia, roast beef is one of the meats traditionally served at Sunday dinner. A traditional side dish to roast beef is Yorkshire pudding. 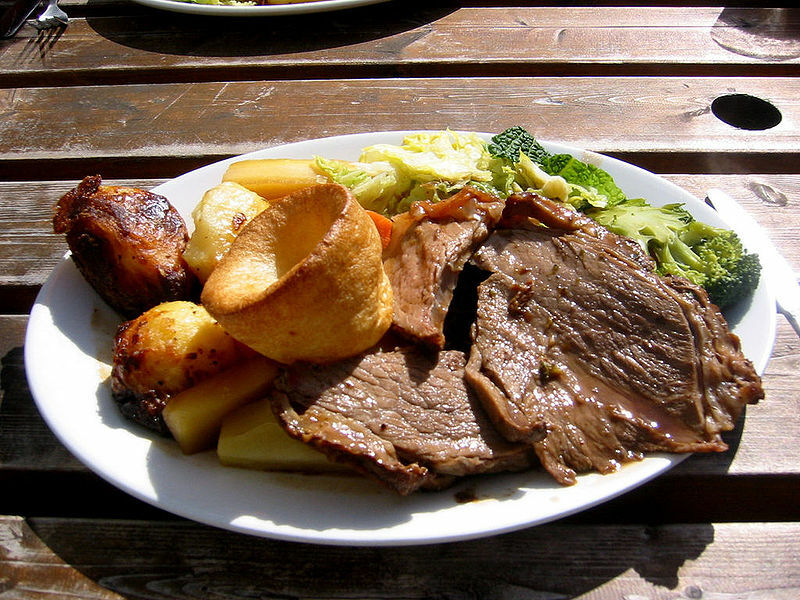 In England, roast beef is the signature national dish which holds cultural and nationalistic meaning for the English. Roast beef is traditionally served "rare" or "pink", meaning that the centre of the joint is warmed, but not cooked so that it retains the red color of raw beef. It should be noted however that there are health concerns associated with the consumption of commercially prepared rare beef (below 130F). The beef on weck sandwich is a tradition in western New York. Roast beef is sometimes served with horseradish or horseradish sauce.